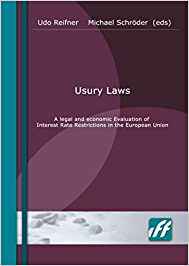 Usury Laws - iff - institut für finanzdienstleistungen e.V. Usury is the historical denomination of interest rate restrictions. The principle of Usura in the Roman ius communis as well as in canonic law started from the assumption that money lent from others should not bear interest. This is because unless the creditor could prove that the withhold of money caused him damage, money could not create fruits. While the upcoming trade economy developed the idea that the elapsed time between the claim and its fulfillment should be priced with interest, a second principle of interest limitation became important: the laesio enormis: interest rates should be limited to the double of the average. Since consumer credit has spread into the market economy and become a major source of allocating future income to present needs (extended mainly by rationally acting banks), both principles have lost of their impact onto the credit market. But a number of member states have newly introduced rate ceilings. With the financial crisis, the discussion whether interest rates in consumer credit needs more regulation gathered momentum. The present study was commissioned by DG Internal Market. It has two parts: a socio-legal analysis of all forms of direct and indirect limitations for the pricing of credit by the Institute for Financial Services (iff) in Hamburg and an economic part investigating the effects of such restrictions to the consumer credit market by the Center for European Economic Policy (ZEW) in Mannheim.